/26/1993: Mere weeks after our country swears in a new president, al-Qaeda tries to destroy the World Trade Center in New York. President Qlinton treats it as a crime. Al-Qaeda keeps directly attacking us. 9/11/2001: Mere months after our country swears in a new president, al-Qaeda destroys the World Trade Center in New York and tries to destroy the Capitol and the Pentagon in Washington. President Bush treats it as an act of war. Al-Qaeda stops directly attacking us. SEATTLE, WA — Joe Biden says he's certain that if Barack Obama is elected president, there will be an international crisis to test his strength within the first 6 months of his presidency. "Mark my words. It will not be six months before the world tests Barack Obama like they did John Kennedy. The world is looking. We're about to elect a brilliant [sic] 47-year-old senator president of the United States of America," he told a fundraising crowd in the Pacific Northwest on Sunday. "Remember I said it standing here if you don't remember anything else I said. Watch, we're gonna have an international crisis, a generated crisis, to test the mettle of this guy." But, bin Biden, can you guarantee that it's going to happen? "He's gonna have to make some really tough — I don't know what the decision's gonna be, but I promise you it will occur. As a student of history and having served with seven presidents, I guarantee you it's gonna happen." Thanks for giving us The Official bin-Biden Guarantee™ on that. Al-Qaeda terrorists never give up on completing any previously failed "martyrdom operation." Witness their World Trade Center 1993 failure and 2001 success. So, based on The Official bin-Biden Guarantee™, they'll similarly turn their Capitol and Pentagon 2001 failure into their 2009 success. No doubt we'll see Obama bin Biden supporters afterwards holding up signs that also say, "I [Heart] DC... even more without the Capitol & Pentagon." Another decision to look forward to (if you hate those buildings and everyone inside them, that is). The Delaware Sen[ile]ator made similar remarks at a San Francisco fundraiser the day before. "We're going to face a major international challenge. 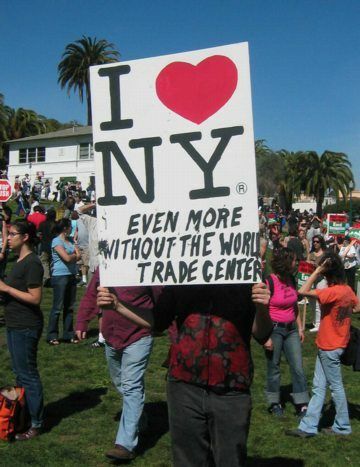 Because they[ al-Qaeda, a.k.a. Our Enemy]'re going to want to test him, just like they did young John Kennedy. They[ al-Qaeda, a.k.a. Our Enemy]'re going to want to test him [Repeated for emphasis!]. And they're going to find out this guy's got steel in his spine," Biden said. But fire melts steel. Especially when it's the radioactive variety. He told the crowd to continue to stand by Obama and know they made the right choice even when the going gets tough. Because making sure that our children, as well as the rest of our families, will be left wide open to a guaranteed horrific terrorist attack that kills them is The Right Choice®. When they die, that's just tough (for you). Vote Obama bin Biden! The Democratic VP nominee has talked about the difficult environment the next president, no matter who he is, will step into — calling it the toughest since the Great Depression — but never before suggested that Obama in particular would be tested because of who he is. That is, Jr. 1-term-only Sen. Obabe-in-the-woods is miserably inexperienced and untested (the exact opposite of the extraordinarily experienced and very much tested Arizona senator and United States Navy captain, John McCain). Therefore, Jr. 1-term-only Sen. Obabe must and will take this test. A test that, unfortunately for you, you'll have to pay for — with your and your loved ones' lives, whatever else its outcome. Vote Obama bin Biden! The RNC and the McCain campaign both jumped on the remarks — with the McCain campaign claiming Biden guaranteed an international crisis in the event of an Obama election. South Carolina Senator and top McCain adviser Lindsey Graham already used the remark against the Obama campaign while introducing the Arizona Senator this morning. That "we're gonna have an international crisis, a generated crisis." That "it will not be six months before" this planned major crisis happens. That, yes, bin Biden can "guarantee you it's gonna happen." That, even so, the "right choice" is Vote Obama bin Biden! That's not what bin Biden said. That's why I included his exact quotes before that miserably failing attempt of yours to spin bin Biden's Rock Solid Guarantee™ into yet another of those weaselly wishy washy flip flopping evasions for which the Obama bin Biden al-Qampaign has become widely known and loathed. That means terrorists. Al-Qaeda terrorists who must and will test Jr. 1-term-only Sen. O'AllTalkNoDo. Start taking snap shots of the Capitol and Pentagon now, because, yes, bin Biden can guarantee neither will be around "not six months" after last Sunday if — mark his words — we the people terrorists' targets Vote Obama bin Biden! ...we know that we need steady leadership in tumultuous times, not the erratic lurching and stubborn [liberal, surrender-at-all-costs] ideology of John McCain Barack Hussein Obama." There. Repaired it for you. That repair even comes with The Official Liberal Utopia Guarantee™. Listen to the audio of Biden's full Seattle remarks here — the comments in question are about 10 minutes in. Please listen — before you vote. 2 + 26 + 1993 = 2021. 9 + 11 + 2001 = 2021. 4 + 08 + 2009 = 2021 (i.e., last such sum-date in 2009 conforming to bin-Biden's "will not be six months before" timeline).